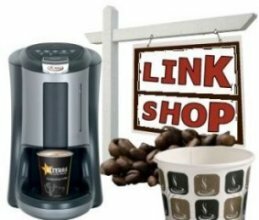 What Sort of Coffee Machine Do You Need? 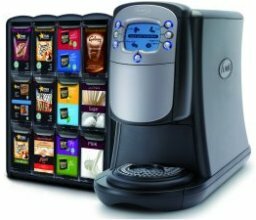 Explore our website for commercial vending machines, coffee machines, and water coolers. Learn more about the Charities we support and how you can support them. So have a browse and let us know what you are looking for. systems to choose from we will have the right machine for you. of day. Just plug in and go, installed in a few minutes and that includes the coffee. Link Vending provides vending machine solutions throughout London and the UK. and using our business to support a number of charities. to support charities around the world at the same time. And support one of our chosen charities at the same time. See our chosen charities, that also includes WaterAid. sugar sticks, stirrers, whiteners, toppings, milk pots and more. need to restock while also giving a helping hand to our chosen charities. today and receive the next working day. 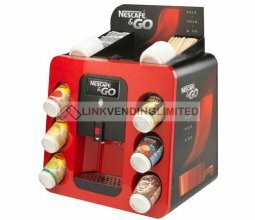 The Nescafe & Go Vending Machine is the perfect portable drink solution for receptions, offices, workshops and more. Large 12oz branded drink refills, each individually foil-sealed, in insulated, paper cups making the machine the ideal take-away solution for newsagents and small retail outlets. We offer 19 different drinks including Nescafe Coffees, Cappuccino, Aero, Tetley, PG Tea, Cadbury's Chocolate, winter soups and more. – just add hot water. 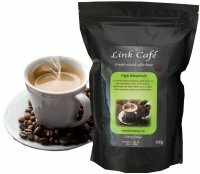 You can shop and pay online for our unique lines including freshly roasted coffee beans from Link Café, our special single price club for all Flavia drinks and our cheap as chips range that work. Unique ranges on paper cups from packs of 25 to 2000 cups, sugar, biscuits and milk for the office and a comprehensive range of vending drinks and sundries. All available for next day delivery that’s free if you spend £70.00 or more. 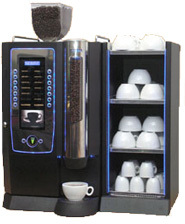 Vending at its best with our superb range of floor standing and table top vending machines. 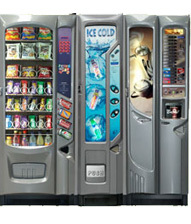 UK vending machines for sale, rent or lease. Full after sales care with vending drink supplies and vending machine maintenance. Complete hot, cold, snack, food and bottle vending machine solutions including bespoke vending machines. We specialise in plumbed-in water coolers and offer a complete service. Our range includes water coolers, water chillers, water fountains, bottled water coolers and under counter and power chillers. Water coolers with proven reliability and innovative technology that's demanded for the modern hygiene environment. Optional servicing and installation is all part of our service. New Winter Warmer Soups... Just Add Hot Water! Individual or National Company we will be happy to provide a quotation. We're proud of our unique charity links. Helping others in this challenging environment our donations are now over £15,000. Registered charity?.. We can support you to.